The passenger compartment remained stable during the impact and the screen pillar was displaced rearward by less than 10mm. Protection of the passenger dummy was rated as good for all body regions. The driver's knees and femurs were well protected by the knee airbag. Volkswagen were able to demonstrate that the airbag would provide a similar level of protection to occupants of different sizes or those sat in different positions. In the car side impact, the car lost a fraction of a point for chest protection. Since Euro NCAP's tests, a clip securing the side airbag has been upgraded by Volkswagen and is fitted to all customers' cars. Good protection was provided against whiplash injuries in a rear impact. 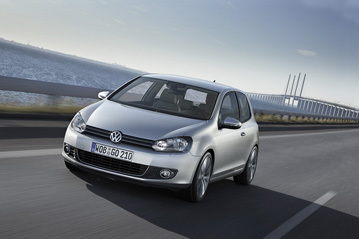 Based on the dummy readings from the dynamic tests, the Golf scored maximum points for its protection of both infants. The car lost points for its non-permanent, pictogram-only label warning of the dangers of placing a rearward facing child restraint in the front passenger seat without first disabling the airbag. The passenger airbag can be disabled to allow a rearward facing child seat to be used but information provided to the driver about the status of the airbag is not sufficiently clear. The rear outboard seats have ISOFIX and top-tether anchorages and these are clearly marked. The bumper scored maximum points for the protection it offered to the legs of a struck pedestrian and the front edge of the bonnet was rated as good in some areas. The protection offered by the bonnet to the head of a struck child was rated as predominantly good but that offered to an adult pedestrian was mostly poor. Electronic Stability Control is standard equipment on all of the model range. The Golf has a driver and passenger seatbelt reminder system.